Dub poetry is represented in Birmingham by Moqapi Selassie, a performance poet of Jamaican parentage who was born in England and who has been writing and performing in the UK for many years now. He belongs to the Black British generation, the children of Jamaican immigrants who settled down in the UK in the late 1940s and throughout the 1950s. 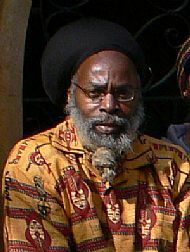 Moqapi Selassie is well known for his perfomance events, brining his poetry to adults and young people alike, as well as his amazing one man show "Blackheart Man".